Aerovías de México, S.A. de C.V. operating as Aeroméxico (stylized as AEROMEXICO), is the flag carrier airline of Mexico based in Mexico City. It operates scheduled services to more than 90 destinations in Mexico; North, South and Central America; the Caribbean, Europe and Asia. Its main base and hub is in Mexico City, with secondary hubs in Guadalajara and Monterrey, and focus cities in Cancún and Tijuana. The headquarters is in the financial district on Paseo de la Reforma, formerly in its own building overlooking the Diana the Huntress Fountain, but moved down the street in 2017 to the Torre MAPFRE tower across from the Mexican Stock Exchange while the old building is demolished and replaced with a much taller new tower. Grupo Aeroméxico includes Aeroméxico, Aeroméxico Connect (regional subsidiary), and Aeroméxico Contigo (on select U.S.-Mexico Routes). The group held #1 place in domestic market share with 36.6%; and #2 place behind American Airlines with 15.3% of the international market share, in the 12 months ending March 2014, becoming Mexico's largest domestic airline group. Aeroméxico is one of the four founding members of the SkyTeam airline alliance, along with Air France, Delta Air Lines and Korean Air. Aeroméxico works closely with the U.S. carrier Delta Air Lines, which owns part of Aeroméxico and in 2015 announced its intention to acquire up to 49%. On 8 May 2017 a joint commercial agreement (JCA), came into effect, whereby the airlines share information, costs, and revenues on all their flights between the United States and Mexico. In 2016, the company flew 19,703,000 passengers (up 5.0% vs. previous year), of which 13,047,000 domestic (+3.7%)and 6,656,000 international (+7.6%). It flew 34,776,000 revenue passenger kilometers (RPKs), had 43,362,000 available seat kilometers (ASKs), and an 80.3% load factor. The airline was established as Aeronaves de México on 15 September 1934, by Antonio Díaz Lombardo. 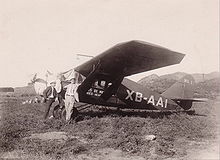 Its first aircraft was a Stinson SR Reliant 5A (registered XB-AJI). Julio Zinser piloted the maiden flight on the Mexico City – Acapulco route on 14 September 1934. When World War II began, the airline continued to grow with the help of Pan Am, which owned 25% of the new Mexican airline. Aeroméxico saw few changes for the next two decades. However, during the 1950s, renovation began, and the airline took over various small competitor companies across the country, including Aerovías Guest (the second airline of the country at that time) that held the routes to Madrid and Paris. Aeroméxico added aircraft including the Douglas DC-3 and its successor, the Douglas DC-4. During the late 1950s, the Douglas DC-4s were replaced by some pressurised Douglas DC-6s and two Bristol Britannias (the first turboprop passenger aircraft in the fleet) and in 1958, services were inaugurated to Idlewild Airport (now JFK) using the Britannias. The Mexico City-New York route would prove profitable for "Aeronaves" and its North American competitors. The airline was nationalised in 1959. In the early 1960s, the fleet of Aeronaves de México (Aeroméxico) included Douglas DC-3, Douglas DC-6, and Bristol Britannia aircraft. Starting in 1961, "Aeronaves" began replacing its piston-engined aircraft with new jets. The first jet-engined aircraft were a pair of Douglas DC-8s. The DC-8s were used on routes within Mexico and to New York City. In 1963, Aeronaves de México (Aeroméxico) took over Aerovias Guest airlines and they were merged under the name Aeronaves de México. Later in the 1960s, more DC-8s were added and service to Europe was resumed, operated by two de Havilland Comet 4C jet aircraft dry-leased by Aerovías Guest prior to the merger. The 1970s brought dramatic changes for Aeroméxico. In 1970, under a government plan, Mexican domestic airlines were nationalized into an integrated air transport system under the control of Aeronaves de México. The system included eight smaller carriers, although these were later disbanded. 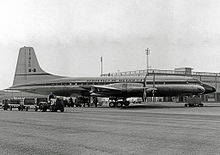 During the early 1970s, the remaining Douglas DC-6 and Bristol Britannia aircraft were retired. A new color scheme (orange and black) was introduced and the airline changed its name from "Aeronaves de México" to its current, shortened version of Aeroméxico in February 1972. Aeroméxico, as one of the launch customers of the McDonnell Douglas DC-10-30 program, received the first of its aircraft in 1974. That same year the airline also took delivery of its first seven McDonnell Douglas DC-9-32s. During this period the airline's popularity and visibility grew dramatically. This was due in part to Aeroméxico's involvement in Mexican movies. Basically, every time characters in any movie produced in Mexico had to fly somewhere, they were depicted as flying on Aeroméxico aircraft. 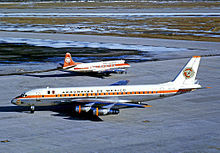 Service to Canada was initiated and in the early 1970s, two more DC-9-15s were added to the fleet. The early 1980s were marked by expansion. A new color scheme was introduced (orange paint and silver), two DC-10-15s and a DC-10-30 were added in 1981 and in 1984. Aeroméxico, one of the launch customers of the McDonnell Douglas MD-82 (an elongated version of the DC-9), received its first two in late 1981. Between 1980 and 1981, eight more DC-9-32 aircraft were added. On 31 August 1986, the company suffered its only fatal accident outside Mexico when Aeroméxico Flight 498, a Douglas DC-9, approaching Los Angeles International Airport was struck by a light aircraft. Both aircraft then fell to earth in the Los Angeles suburb of Cerritos, California. All 64 passengers and crew on board the DC-9-32 were killed, as were the three people in the light aircraft and 15 people on the ground. After three years and a long trial, the aircraft's crew and the airline were found not to blame. This was because the pilot of the Piper had strayed into an air traffic control zone reserved for commercial flights. That same year, the airline acquired the charter carrier GATSA and used it for charter operations until December. In April 1988, the state-owned company was declared bankrupt and grounded for three months because of lack of organization, a fleet with an average of 20 years without a renovation plan and a depredating administration by the Mexican Government. In August, a privatization program was underway. This involved retiring the eight Douglas DC-8s along with the remaining ten DC-9-15 aircraft. Starting the privatization process included a new corporate name (Aerovias de Mexico SA de CV). The airline restarted operations with its predecessor's assets, including the headquarters building, maintenance hangar, some aircraft and some former Aeronaves de Mexico employees. The early 1990s were turbulent times, with the rise in fuel costs due to the Gulf War, and a domestic fare war caused by start up airlines like TAESA, Servicios Aéreos Rutas Oriente, Aviacsa, among others, as well as constant labor problems. In April 1991 the first two 767-200ERs were introduced to the fleet starting to replace DC-10s in services to Europe, New York and Tijuana, another two 767-300ERs joined the fleet later that year. This was all a part of a renovation and expansion program to introduce 24 direct flights to Madrid and Paris from Mexico City with Boeing 767s as well as services to Frankfurt via Paris and Rome via Madrid. In 1992 Grupo Aeroméxico was among other investors that failed to consummate the acquisition of Continental Airlines. After failing to invest in Continental, Aeroméxico acquired the bankrupt Aeroperú from the Peruvian government. In 1993 Aeroméxico Group took over Mexicana, the second largest airline in the Mexican market under the same management. There was a great dispute in June 1993 with the pilot union regarding the transfer of flights to regional subsidiary Aeromonterrey, which had non-union pilots. Between 1994 and 1995, the six DC-10 aircraft in the fleet were finally retired. Their last revenue flight was in 1995. In December 1994 (three weeks after Carlos Salinas de Gortari left the office), the first of several devaluations in the next 18 months started, giving way to an economic crisis in Mexico. As a consequence, Aeroméxico had to cut capacity and flights to Frankfurt and Rome were canceled, four McDonnell Douglas MD-80s and four Boeing 767s were returned to their lessors, early retirement for pilots and other staff was underway, and a new Boeing 767 due for delivery in April 1995 was instead transferred to another airline. Flights to Madrid and Paris were operated only by two Boeing 767-300ER jets. In 1996 Cintra was created to prevent the two main carriers from going bankrupt. Some Boeing 757s of Aeroméxico's original renovation program were transferred to Mexicana and Aeroperú. The market and the airline recovered between 1996 and 1998; eight McDonnell Douglas MD80s were leased back along with two Boeing 767-200ERs. The sale of Grupo Cintra was scheduled after several delays in September 1999, and with the looming presidential elections in 2000, everything was delayed once again. The ruling party lost the election after 70 years in office and all the policies changed. Due to the recession in 2000, the new government put everything on hold, waiting for better economic conditions to start the stock sell-off, and just when everything was about to start, the 11 September 2001 attacks occurred and nothing materialized since the two main carriers, Mexicana and Aeroméxico, were losing large amounts of money. Between 2000 and 2005, Aeroméxico had an average fleet of 60 aircraft in mainline operation, plus 20 in Aerolitoral, as well as five CEOs during this time. On June 22, 2000, the airline, along with Air France, Delta, and Korean Air, founded the SkyTeam global airline alliance. After 9/11 and the Iraq War, it pursued a fleet renovation program. In 2003, the airline acquired its first Boeing 737-700 instead of the Boeing 717 as a replacement for its aging DC-9 aircraft. On 29 March 2006 Aeroméxico CEO, Andrés Conesa announced the inauguration of direct flights between Japan and Mexico City via Tijuana. This was after the purchase of two Boeing 777-200ERs, making Aeroméxico the third airline in Latin America to fly regularly to Asia, after Varig and the now defunct VASP. Since Varig's demise, Aeroméxico is currently the only airline with this service. Aeroméxico resumed its Mexico City-Tijuana-Shanghai route twice a week as of 30 March 2010. Suspension of this flight was due to the 2009 flu pandemic. 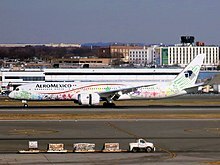 On 29 June 2006, the International Lease Finance Corporation (ILFC) and Aeroméxico announced that the airline would operate three Boeing 787 Dreamliners. Aeroméxico's deliveries were scheduled to begin in early 2012. From 2006, Consorcio Aeroméxico S.A. de C.V., the parent company of Aeroméxico at the time, faced large debts and had no profits to pay them off, so it offered Aeroméxico for sale in 2007. In early October, a week-long auction was held, with Grupo Financiero Banamex, a unit of Citigroup, competing against the Saba family. On 17 October 2007, Banamex offered the highest bid and purchased the airline for US$249.1 million. In October 2010, Aeroméxico's largest competitor, Mexicana de Aviacion, filed for bankruptcy and was placed in administration. In 2011, Delta Air Lines and Aeroméxico signed an enhanced commercial alliance, building on an original agreement from 1994. The 2011 agreement provided for codeshare on all the carriers' Mexico–US flights; Delta investing 65 million USD in Aeroméxico shares; and Delta gaining a seat on the Aeroméxico board of directors. In March 2014, the airlines opened Tech Ops Mexico, a 55 million USD joint maintenance, repair and overhaul facility in Queretaro City, Mexico. In March 2015, the airlines filed applications for antitrust immunity, a first step in the creation of a 1.5 billion USD joint cooperation agreement (JCA) that will allow Delta and Aeroméxico to jointly sell, and share costs and profits on all Mexico–U.S. routes. In May 2015, Mexican regulator approved the JCA; and in the same month the Mexican Senate approved Open Skies between the U.S. and Mexico. In November 2016, the DOT approved the joint venture under strict conditions that the airlines give up slots in both Mexico City and New York-JFK. In December 2016 the two airlines made the final agreement to go forward with the JV and antitrust immunity was granted. In February 2017, Delta announced an offer to acquire additional shares of Aeroméxico, up to 49%. On 8 May 2017, the joint commercial agreement went into effect, whereby the airlines share information and jointly determine routes and pricing on all U.S.-Mexico flights, and share costs and profits. On 25 July 2012, Aeroméxico CEO Andrés Conesa announced the purchase of six Boeing 787-9 Dreamliners. The new order was added to the package of 20 aircraft that the company had announced in 2011 and nine more Boeing 787-8 Dreamliner already provided. The delivery of the Dreamliners began in the summer of 2013. The total investment is US$11 billion and includes the acquisition of 90 Boeing 737 MAX 8 which began delivering from 2018. The airline took delivery of its first Boeing 787-8 Dreamliner (sourced from the ILFC order book) in early August 2013 and officially launched commercial service on 1 October 2013. Between 2013 and 2015, the remaining eight were delivered (seven leased and two owned by Aeroméxico outright). Aeroméxico Boeing 787-9 Dreamliner painted in special Quetzalcoatl Livery. In September 2016, Aeroméxico received its first Boeing 787-9 Dreamliner. This particular frame, registered XA-ADL, is named after and painted in a unique commemorating Quetzalcoatl, a major figure in Aztec culture of pre-Hispanic Mexico, as the result of a "Design in the Air" competition hosted by the airline inviting students at select universities in Mexico to submit a potential design to be painted on the airframe. In February 2018 Aeromexico introduced a new branded fares structure including a new Basic fare which did not include a checked luggage allowance nor allow for seat assignments, upgrades or changes. In 2016, Aeroméxico added 2Ku WiFi service by Gogo to some 737-800 aircraft, including access to Netflix. On its 787-8 and 787-9 Dreamliners it added Panasonic broadband Internet, and on Embraer narrowbody aircraft, streaming entertainment via Gogo's Gogo Vision. In July 2016, the airline launched a completely new website and new check-in kiosks at Mexico City airport. That same year, the airline also co-sponsored the launch of startup accelerator MassChallenge in Mexico. In September 2016, Aeromexico became the first airline in the Americas to launch a chatbot, that enables customers to search, track and book flights interacting with a virtual assistant on Facebook Messenger. During the Facebook F8 conference in April 2017, the airline earned praise from Facebook for being among the first companies worldwide to launch the Chat Extension function, allowing users to pull up Aerobot during a group chat. It also launched the ability to ask any question, using artificial intelligence and natural language processing techniques to match the questions with answers. In September 2017 Aeromexico announced that it would be among the first companies worldwide to start services on WhatsApp's new Enterprise solution – the first time large companies would be able to provide customer service to users at scale. In February 2018 the company announced development of further features together with its partner Yalochat, such as purchase confirmation and flight notifications via WhatsApp, and deepening the artificial intelligence used on its chat platform. In an attempt to gain more worldwide presence and strengthen its network and to make connections easier and more frequent, Aeroméxico has started to develop new international markets. From 2006 it started operations to Tokyo from Mexico City via Tijuana. Service to Shanghai from Mexico City via Tijuana began in May 2008. New destinations in 2015–2016 included Panama City (Panama), Santo Domingo, Vancouver, Toronto, Boston, Medellín, Amsterdam, Cozumel, and Austin (Texas). The airline launched service to Seoul from Mexico City (with a stop in Monterrey only on the outbound flight) on 1 July 2017. In the first year of the Delta–Aeromexico joint venture (June 2017–June 2018) the companies worked to enhance connectivity between Mexico and the U.S., and launched new Aeroméxico or Delta flights, or additional frequencies, on Los Angeles-Cabo San Lucas; New York JFK-Cancun; Detroit-León; Atlanta-Mérida; Seattle-Mexico City; Atlanta-Querétaro; Atlanta-León; Portland-Mexico City; Los Angeles-Leon; Atlanta-Guadalajara; and Guadalajara-Salt Lake City. Aeromexico Express was a commuter airline based at Monterrey International Airport. It was a partnership between Aeromexico and Aeromar. It ceased to exist in June 2016 when the two wet-leased ATR 72-600 it used to operate its routes were returned to Aeromar. All of Aeroméxico's Logos Since it was Founded in 1934. 1990s – La línea aérea mas puntual del mundo. 2010–2012 – A donde te lleven tus sueños. 2012–2013 – Nunca nos detenemos. 2013–present – La línea que nos une. 2016–present – La línea de los Mexicanos y del mundo. English slogan: "Mexico's Global Airline"
26 March 1954 near Monterrey, México – XA-GUN a Douglas DC-3. 2 June 1958 near Guadalajara, México – XA-MEV, a Lockheed L-749A Constellation operating as Flight 111, crashed into La Latilla Mountain, 16 kilometers (10 miles) from the Guadalajara Airport, shortly after takeoff for a flight to Mexico City after the airliner's crew failed to follow the established climb-out procedure for Guadalajara Airport. The crash killed all 45 people on board, and two prominent American scientists – oceanographer Townsend Cromwell and fisheries scientist Bell M. Shimada – were among the dead. It was the deadliest aviation accident in Mexican history at the time. 13 August 1966 near Acapulco, Mexico – XA-PEI a Douglas DC-8-51. On 20 June 1973 Douglas DC-9-15 XA-SOC near Puerto Vallarta, Mexico, Aeroméxico Flight 229, a daily service from George Bush Intercontinental Airport to Lic. Gustavo Díaz Ordaz International Airport, crashed into the side of a mountain while on approach, killing all 27 people on board. On 27 July 1981, Aeromexico Flight 230 XA-DEN a Douglas DC-9-32 crashed while landing in Chihuahua, killing 32 of the 66 people on board. 8 November 1981 XA-DEO a Douglas DC-9-32 in Sierra de Guerrero, México. On 31 August 1986 Aeromexico Flight 498, operated with a McDonnell Douglas DC-9-32, was on its final approach into Los Angeles International Airport when it collided with a Piper PA-28 Archer over Cerritos, California. The resulting crash killed all 67 people on both aircraft and 15 people on the ground in Cerritos. On 6 October 2000, Aeroméxico Flight 250 N936ML a Douglas DC-9-31 overran the runway at General Lucio Blanco International Airport, Reynosa, Mexico, killing 4 people on the ground. On 9 September 2009 Aeroméxico Flight 576 was hijacked between Cancún and Mexico City. The hijacking ended in Mexico City with no casualties. On 20 May 2017, Aeroméxico Flight 642, a Boeing 737-800, collided with a utility truck at Los Angeles International Airport, injuring 8 people, two of them seriously. ^ "Aeroméxico Air Operators Certificate". av-info.faa.gov. Retrieved 25 July 2018. ^ a b c d e "Aeromexico". aeromexico.com. Retrieved 4 August 2017. ^ "Grupo Aeromexico S.A.B. De C.V. Releases Results for the Fourth Quarter and Full Year 2011". Reuters. 21 February 2012. Retrieved 23 February 2012. ^ "Report on Actions of Social Responsibility." Aeroméxico. 41 (43/44). Retrieved on 4 December 2010. "Paseo de la Reforma 445, Col. Cuauhtémoc. C.P. 06500 México D.F." ^ Aeroméxico. "Aeroméxico – Destinos Aeroméxico". Aeroméxico. Retrieved 7 January 2016. ^ "Aeroméxico". Edemx.com. Retrieved 24 April 2015. ^ ".::. Grupo BMV .::. Profile". bmv.com.mx. ^ "Aeromexico outlines its revenue and network strategy in an uncertain Mexican market". Centreforaviation.com. Retrieved 24 April 2015. ^ a b "Delta and Aeromexico to launch Joint Cooperation Agreement". Delta News Hub. Retrieved 4 August 2017. ^ a b Painter, Kristen Leigh (21 December 2016). "Delta to move forward with Aeromexico joint venture". Startribune.com. Star Tribune Media Company LLC. Retrieved 5 January 2017. ^ C.V., Grupo Aeromexico S.A.B. de. "Aeromexico Reports December 2016 Traffic Results". Prnewswire.com. Retrieved 4 August 2017. ^ a b "Directory: World Airlines". Flight International. 27 March 2007. p. 49. ^ ITF News. International Transport Workers' Federation. 1994. ^ a b "Delta and Aeroméxico: A 21-year partnership". Delta News Hub. Retrieved 4 August 2017. ^ Lines, Delta Air. "Delta and Aeromexico Create Enhanced Commercial Alliance". Prnewswire.com. Retrieved 4 August 2017. ^ "Delta announces launch of cash tender offer to acquire additional shares of Grupo Aeromexico". Delta News Hub. Retrieved 4 August 2017. ^ "Boeing, Aeromexico Announce Commitment for 100 Airplanes - Jul 25, 2012". Boeing.mediaroom.com. 25 July 2012. Retrieved 6 October 2012. ^ "Finanzas - Aeroméxico invertirá 11 mil mdd para comprar 100 aviones". El Universal. 25 July 2012. Retrieved 6 October 2012. ^ Linda Blachly (14 June 2013). "Aeromexico to take delivery of first 787 in August". ATWOnline. Retrieved 30 June 2013. ^ "AeroMexico unveils its first Boeing 787-9 Dreamliner, named "Quetzalcoatl" in a special livery". World Airline News. 7 September 2016. Retrieved 19 December 2016. ^ "Delta expands Basic Economy into Mexico as partner Aeromexico introduces branded fares". Delta News Hub. ^ Gogo. "Gogo's 2Ku Technology Takes Flight on Aeromexico". Prnewswire.com. Retrieved 4 August 2017. ^ "Aeromexico". aeromexico.com. Retrieved 4 August 2017. ^ Álvarez, Domingo (August 2016). "Las puertas del cielo (The gates to heaven)". Aire. Grupo Expansión: 82. Retrieved 6 August 2016. ^ "Aeroméxico apoya la iniciativa de MassChallenge" [Aeroméxico supports the MassChallenge initiative] (Press release) (in Spanish). Aeroméxico. Retrieved 7 August 2016. ^ "AM Lab 7 on LinkedIn: "The new Aeromexico app is…". ^ "La productora de contenido creativo MediaMonks llega a México - Marketing 4 Ecommerce - Tu revista de marketing online para e-commerce". 14 February 2018. ^ "Aeroméxico comienza a utilizar Aerobot, el primer chatbot de una aerolínea en el continente" [Aeroméxico begins to use Aerobot, the first airline chatbot in the continent]. prnewswire.com (in Spanish). Aeroméxico. Retrieved 5 January 2017. ^ "Aeromexico taps Yalochat.com and IV.AI to build first advanced AI Customer Service Chatbot". Traveldailynews.com. Retrieved 4 August 2017. ^ "Building for People, and Now Businesses". WhatsApp.com. ^ "AM Lab 7 on LinkedIn: "Yesterday, WhatsApp announced WhatsApp for…". ^ López, Andrea (30 October 2017). "Ahora, gracias a Yalo, podrás chatear con Aeroméxico vía Whatsapp - TecReview". ^ "Yalo, la tecnología mexicana que lleva Whatsapp a Aeroméxico". ^ Español, Entrepreneur en (22 February 2018). "Yalochat abre oficinas en China y profundiza su relación con Aeromexico". ^ "New Destinations and Routes". aeromexico.com. Retrieved 4 August 2017. ^ "Aeromexico Announces Seoul, South Korea as Its New Destination in Asia". Marketwatch.com. Retrieved 4 August 2017. ^ "Next destination: Seoul, Korea" (in Spanish). Aeroméxico. January 2017. Retrieved 23 May 2017. ^ Aeroméxico. "Aeromexico and Delta celebrate successful first year of joint cooperation agreement". ^ "Profile on Aeromexico". CAPA. Centre for Aviation. Archived from the original on 30 October 2016. Retrieved 30 October 2016. ^ Liu, Jim (21 December 2019). "Aeroflot / AeroMexico begins codeshare partnership from late-Dec 2018". Routesonline. Retrieved 11 January 2019. ^ "JAL Group - PRESS RELEASES - Aeromexico and Japan Airlines Announce Codeshare Agreement". press.jal.co.jp. ^ "Aeromexico Flota". airfleets.es. Retrieved 22 August 2018. ^ "Aeromexico: Our Fleet". Aeromexico.com. Retrieved 16 April 2014. ^ "Aeromexico to take first 737 Max 9 in 2019". Flight Global. ^ C.V., Grupo Aeromexico, S.A.B. de. "Aeromexico Announces Launch of New "Aeromexico Contigo" Product". Prnewswire.com. Retrieved 4 August 2017. ^ "Aeromar - Nuevas rutas - Página 34 - FsMex.com". Fsmex.com (in Spanish). Retrieved 15 March 2017. ^ Satelliten/Hamburg. "SLOGANS.DE // Die Datenbank der Werbung!". Slogans.de. Retrieved 4 August 2017. ^ "ASN Aircraft accident Douglas C-53-DO (DC-3) XA-GUN Monterrey". Aviation-safety.net. 25 March 1954. Retrieved 6 October 2012. ^ "Accident Database: Accident Synopsis 03251954". Airdisaster.com. 25 March 1954. Retrieved 6 October 2012. ^ Ranter, Harro. "ASN Aircraft accident Lockheed L-749A Constellation XA-MEV Guadalajara Airport (GDL)". aviation-safety.net. Retrieved 4 August 2017. ^ "NOAA and the Preserve America Initiative". preserveamerica.noaa.gov. Retrieved 4 August 2017. ^ "NOAA Honors Nisei with Launch of Fisheries Vessel "Bell M. Shimada"". Nvcfoundation.org. Retrieved 4 August 2017. ^ "ASN Aircraft accident Lockheed L-749A Constellation XA-MEV Guadalajara Airport (GDL)". Aviation-safety.net. 2 June 1958. Retrieved 6 October 2012. ^ "Accident Database: Accident Synopsis 06021958". Airdisaster.com. 2 June 1958. Retrieved 6 October 2012. ^ "ASN Aircraft accident Douglas DC-8-21 XA-XAX New York-Idlewild International Airport, NY (IDL)". Aviation-safety.net. 19 January 1961. Retrieved 6 October 2012. ^ "ASN Aircraft accident Douglas DC-8-51 XA-PEI Acapulco". Aviation-safety.net. 13 August 1966. Retrieved 6 October 2012. ^ "ASN Aircraft accident Douglas DC-8-51 XA-NUS Lake Texcoco". Aviation-safety.net. 24 December 1966. Retrieved 6 October 2012. ^ "ASN Aircraft accident Douglas DC-3A-197D XA-FUW La Paz". Aviation-safety.net. 12 June 1967. Retrieved 6 October 2012. ^ "ASN Aircraft accident McDonnell Douglas DC-9-15 XA-SOC Puerto Vallarta Airport (PVR)". Aviation-safety.net. 20 June 1973. Retrieved 6 October 2012. ^ "ASN Aircraft accident McDonnell Douglas DC-9-15 XA-SOF Léon Airport (BJX)". Aviation-safety.net. 2 September 1976. Retrieved 6 October 2012. ^ "ASN Aircraft accident McDonnell Douglas DC-9-32 XA-DEN Chihuahua Airport (CUU)". Aviation-safety.net. 27 July 1981. Retrieved 6 October 2012. ^ "ASN Aircraft accident McDonnell Douglas DC-9-32 XA-DEO Zihuatanejo". Aviation-safety.net. 8 November 1981. Retrieved 6 October 2012. ^ "ASN Aircraft accident McDonnell Douglas DC-9-31 N936ML Reynosa-Gen Lucio Blanco Airport (REX)". Aviation-safety.net. 6 October 2000. Retrieved 6 October 2012. ^ "Aeromexico plane collides with utility truck at LAX, injuring 8". BNO News. 20 May 2017. Retrieved 20 May 2017. Wikimedia Commons has media related to Aeroméxico.